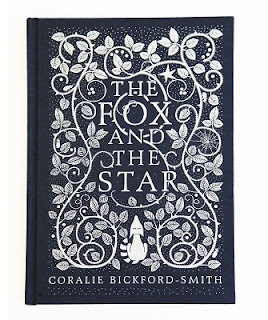 The Fox and the Star , by Coralie Bickford-Smith is a book which is currently being raved about online. It won Waterstones Book of the Year and Goodreads readers are all agog in the hopes that everyone on earth will read this book. I admit that I was curious too, as it was presented to me as a beautiful book perfect for the holidays. When the UPS man delivered this book to my doorstep, I eagerly ripped open the packaging so that I could feast my eyes upon this promised work of wonder. It's entirely my fault that I didn't realize the book only has 66 pages. In my mind, I'd built up a classic feeling Christmas tale with gorgeous illustrations and heaps of magic included. Because of my preconceived notions of what I was going to be reading, I felt an immediate let-down when I cracked open the cover and discovered a picture book. Even more disappointing was that it was a picture book not about Christmas or any other holiday for that matter. Despite feeling a little bit of a let down, the book looked beautiful so I gathered the children around and we sat down for a read. The story is simple. It is about a fox who makes friends with a star in the sky. 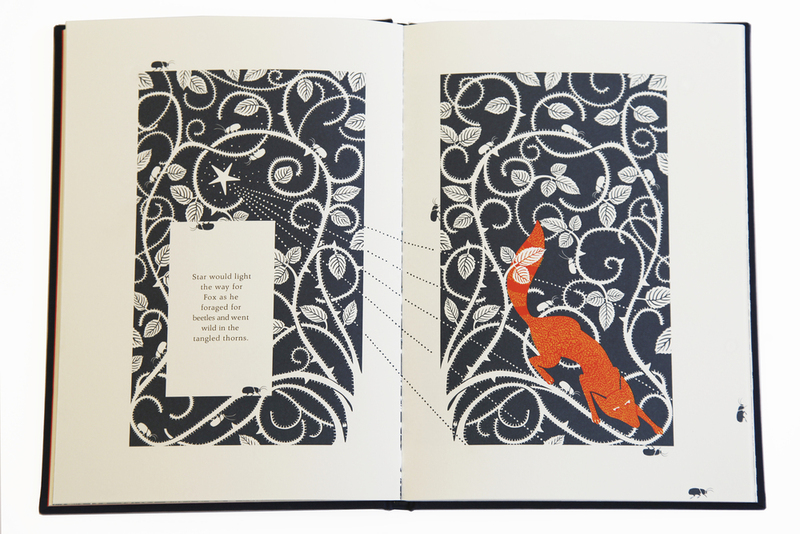 One night the fox is startled and upset to find that he cannot locate his star. He retreats to his den where he spends some period of time feeling lonely and missing his friend. When he comes back out of his den, he begins looking for star when the following message is delivered to him: "Look beyond your ears." When fox looks up at the sky, he discovers a multitude of stars in the sky and he no longer feels alone. You can probably take a dozen messages or personal applications away from this story. For me, it reads off as being a book about loneliness. As an introvert, I find that I focus only one a few friends at any given time. This isn't intentional rudeness (I try very hard not to be exclusive or rude!) but my energies and attention tend to only go so far. From time to time there's a life "shake up" and a close friend might move away or involve themselves in other things. At any rate, some sort of separation occurs in some natural manner and at those times I tend to feel a sense of loneliness. But when I "look beyond my ears" I always find that God has someone (or someones) waiting in the wings awaiting my attention. Through these friends I find myself blessed beyond measure. All of my friends hold a special place in my heart and life and as I've been (and am continuing to) grow up, I realize that the sky is quite full of stars. This book hinted to me of this. Just the fact that I experienced a deep emotion from The Fox and the Star makes it an interesting one to discuss. It's not really a book for adults. But it is. It isn't necessarily geared towards kids, yet mine enjoyed it very much. (They liked the fox.) This story does have a certain timeless, classic feel to it but at the same time, I can't exactly state that the story is as beautiful as it could have been or is completely deserving of the hype it is receiving. One Goodreads reader noted that if the story had been told in poetry form, or if there was more of a cadence or pattern to the words, it would have suited the book better. I happen to agree. I think between the illustrations and the fact that the author felt and wanted to communicate some great truth, more thought should have been given to the text. The illustrations are perfect and yes, the text tangles up into it, but it could have been more polished. I would not say that this book is genius, but I would say its interesting. I wouldn't say it's provocative, but I would say that it promotes some amount of thinking. I don't know that I'd make the claim that this book is even timeless! But I suppose anything is possible. 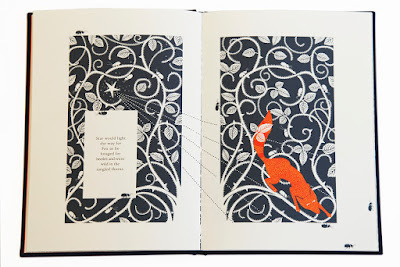 The only thing I will say for The Fox and the Star is that it is unique and that it is wonderfully illustrated. Did I enjoy it? In the end, I did so, despite the fact that it wasn't all I was expecting it to be. My kids also liked it and I'm glad for that. It's not a holiday specific read. It's probably not one that I would personally want to read again and again but I'm glad to have had the chance to read it at all. I may or may not have an overwhelming fixation Coralie Bickford-Smith's fancy covered Penguin classics, bordering on obsession. Planning to collect them one by one over the next ten years. This will probably be among them. Glad to have your review to help me know what to expect from it. This has me "Hmmmm" -ing. I am not sure what I would think of this book. I am not familiar with her illustrations. Interesting take about loneliness - I can see that connection. If I ever saw it in a bookstore I'd be interested to flip through it but I don't think I'd seek it out.